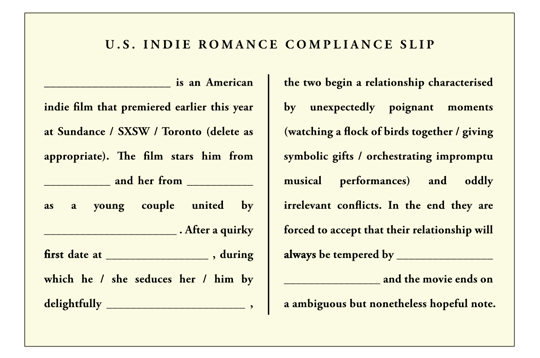 Not sure whether your favourite movie fully qualifies as a bona fide U.S. Indie Romance? Well now you can be! Simply print off this patented Ultra Culture compliance slip and fill it in for yourself! I’ve already completed slips for Like Crazy and The Dish and the Spoon but there’s lots more vital work to be done! Let me know how you get on over on Twitter.